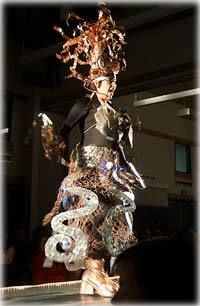 Ketchikan's famous runway fashion show extravaganza took place Febuary 5-7 featuring wearable art. The show was presented by the Ketchikan Area Arts & Humanities Council. 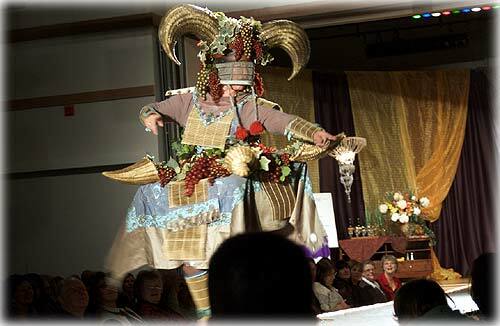 Feast your Eyes presented amazing pieces created by local and guest artists, displayed & modeled on the catwalk in musical numbers performed by some of Ketchikan's finest talents. The youth-oriented Saturday matinee featured student artists, classroom projects. Wells Fargo generously sponsored the 2009 Wearable Art Show. Alaska: Senate Says Governor's Staffers Committed Contempt; Resolution Clarifies Legislature's Authority in Subpoena Cases - By a vote of 16 to 1, the State Senate on Friday passed Senate Resolution 5, stating that ten Palin Administration employees who did not comply with legislative subpoenas last fall committed contempt. "During the Monegan investigation, we were reminded that the legislative branch's power of subpoena is an important one, and must be respected by the executive branch," said Senator Hollis French (D-Anchorage), chairman of the Senate Judiciary Committee, which sponsored the resolution. "With this resolution, the Senate is making it clear that we are a co-equal branch of state government." Last September, the Judiciary Committee issued subpoenas to ten executive branch employees in connection with the investigation into the circumstances surrounding Governor Palin's firing of former public safety commissioner Walt Monegan. Attorney General Talis Colberg challenged the validity of the subpoenas, and the witnesses did not appear as ordered to testify before the committee. Alaska: VILSACK DELAYS IMPLEMENTATION OF SPECIAL FOREST PRODUCTS AND FOREST BOTANICAL PRODUCTS FINAL RULE - REOPENS COMMENT PERIOD - ecretary of Agriculture Tom Vilsack recently announced the delay of implementing the Sale and Disposal of Special Forest Products and Forest Botanical Products Final Rule until March 30, 2009. The delay will provide the public an additional 30-day comment period ending March 2. "In keeping with President Obama's recent pledge for a more transparent and inclusive government that works for the people, this extension will afford the public an opportunity to participate in the rulemaking process," he said. "This rule is especially important to American Indians and Alaska Natives and we want to make sure that they, and other stakeholders, have an opportunity to have their voices heard." Alaska: ALASKA MARINE DEBRIS DATABASE UNVEILED BY MCAF; Google Earth-based platform shows cleanups, surveys, reports - Information on marine debris cleanup efforts in Alaska - past and present - has been compiled by the MCA Foundation into a Google Earth based database that is now accessible over the internet. The database identifies areas cleaned and surveyed with links to photos with reports of the volume removed and other statistics. Alaska: Defendant Sentenced to 25 years for kidnapping in Muldoon - District Attorney Adrienne Bachman announced Friday, that Doug McClain, a resident of Anchorage, was sentenced for convictions stemming from the torture of two women in a trailer located in Muldoon in April of 2007. A jury convicted the defendant and his two codefendants-Annie Shinault and Brenda Cleveland-in June, 2008. Shinault was sentenced to 51 years for her participation in the offense in October of 2008. Cleveland is set for sentencing in March. Alaska: State offers hepatitis B shots for high-risk adults; Special program available for a limited time - The Alaska Department of Health and Social Services is continuing its limited-time program of offering free hepatitis B shots to high-risk adults. The program, which is funded by a special federal grant, covers the cost of the vaccine for the three-shot series. Vaccine is expected to be available into 2010. DAVE KIFFER: Winter Travel As Easy As (No) Pie - In the winter, you "takes your chances" when it comes to travel in Southeast Alaska. The most calming ferry ride can suddenly turn into a wild bucking bronco when a ship makes a turn into a Southeaster hauling up one of The Straits or moves into "unprotected" waters. And plane flights can end up - well, they can end up in somewhere you didn't intend to end up. For example, some Alaska Airlines passengers ended up in Whitehorse, Yukon Territory recently. That must have been interesting for those not carrying passports or "loonies." It could have been worse. I guess another Alaska Airlines flight recently left Mexico and ended up back in Mexico - after spending the night in Portland! Anyway, I had the pleasure of some travel re-arrangements recently. And no, I didn't get to go to Mexico on my Ketchikan to Juneau flight, although that is an "overhead" we can all get behind. The fault was - naturally - completely mine. Primarily because my wife and I decided to play fast and loose with the air traffic gods. Charlotte was out of town for several days and I decided to schedule a trip north on the day that she got back. We decided to get all fancy and make it so that I would leave on the flight that she would come in on. Therefore, we wouldn't have to worry about getting someone else to look after Liam. I would take him to school in the morning and Charlotte would pick him up after her flight got in. Easy peazy, lemon squeezy, as Liam likes to say.!! Natch, the gods of air traffic didn't much care for our family assumptions about flights coming and going as scheduled. Charlotte's flight from Seattle overheaded Ketchikan. So I had to scramble to "rebook" my flight north for later in the evening and then make arrangements for Liam to bunk out elsewhere for the night (thanks Betty and Kerry!). Meanwhile, Charlotte and others on the flight ended up in Juneau for a fun-filled one day visit.